How can I find out which movies will be playing at my theater in advance? Movie schedules are determined on Mondays and Tuesdays for films opening on Friday of the same week. Schedules are posted on the Wildwood Theatres Web site by Thursday. Due to industry considerations, films, and schedules are subject to frequent changes, so unfortunately, scheduling confirmation can only be released up to five days in advance. Tickets may be purchased from the box office up to two weeks in advance of the film’s opening. Note: purchasing tickets in advance guarantees you a seat to a particular show; however, we do not reserve specific seats in any row. Highly popular films will generate longer lines as shows sell out quickly. We recommend for the most popular films, during the weekends and holidays, that you plan to arrive 20 to 30 minutes prior to the advertised start time. That option is currently available only at Movies 10. We are in the process of setting up on-line ticketing for the other theatres. Please check back for availability. We accept Master Card and Visa at all Wildwood Theatres box offices. How long will my movie play in the theater? The length of time any film will play in any theater is based on the amount of business the film does, contractual obligations and time of the year. Basically, the more popular a film is with patrons, the longer it will play. There is no way to predict exactly how long a movie will play. Use our website to get information on what films will be playing up to five days in advance. How do I know which auditorium my movie will play in at the theater? You can ask for auditorium information at the box office prior to purchasing your ticket. This web site will provide information about sound systems and stadium seating for each film. Click on the Theatre Page button on the left to see details. Our goal at Wildwood Theatres is to provide you with an outstanding experience in every auditorium. Why isn’t a certain movie playing at my theater? We try to play the widest variety of movies in our theatres. Unfortunately, we do not own the films we show, the Hollywood studios do. They determine which theatres will play which movies. In the case of some movies, the studios will make very few prints because their marketing department believes there is a limited number of people who want to see the film. Often these are films that get critical acclaim but are not popular with the general movie going public. Because it can take up to two months for a print to become available to us, the popularity of the film may have waned or there are no screens available to show the film. In rare cases, the film has already been released on video before a print is available to us. How do I get information (or who do I contact) about screen advertising? For information about advertising on a Wildwood Theatres screen in Wisconsin contact Screenvision. Who do I talk to about renting a theater? Please e-mail us at info@wildwoodtheatres.com. Do you reserve seats for large groups? Purchasing tickets in advance guarantees you a seat for each ticket purchased, however, we do not reserve specific seats in any row. Highly popular films will generate longer lines as shows sell out quickly. Large groups need to arrive early if sitting together is important. For reserving an entire auditorium for your party, please email us at info@wildwoodtheatres.com. Can I use my gift cards at any theater? 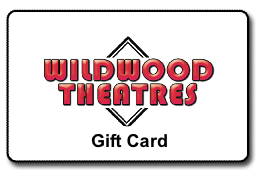 Yes, gift cards are treated the same as cash with no expiration date and are accepted at any Wildwood Theatre, at any time.